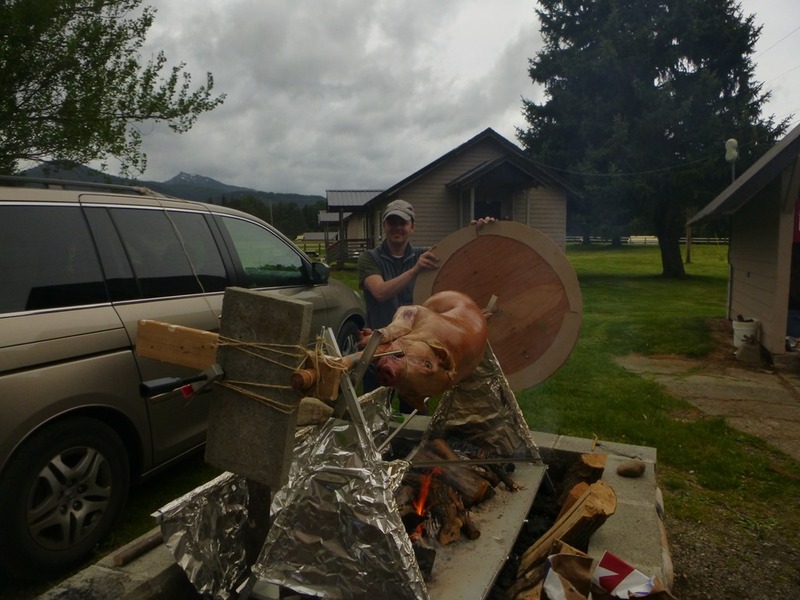 As most of my stories go, the pig roast was almost a success… I learned a lot about how closet rods are manufactured and why they are not ideal for use as rotisserie rods. For those that are just tuning in, here is Part I and Part II, leading up to the big day. First, a big shout out to Adam Robinson who came up with me on Thursday night to prep for the roast. If he wasn’t there, it would have made the ordeal nearly impossible. We drove into Ensign Ranch about 7:30 pm after picking up the pig from Green Valley Meats. We camped out in a tent and woke up around 6:30am to start getting set up. We prepped the pig and applied olive oil and salt inside and out. Then, we shoved the closet rod through the pig. We put apple and onions in the belly cavity and sewed it up with steel bicycle brake cable. Then, we put the pig on to the stand. Ideally, we would have used a steel rod for the rotisserie, but steel is much harder to work with than wood. The advantage of using a wooden rod, is that we could drill holes easily through it. We need to drill some holes to fix the pig to the rod using a clamping mechanism. We also had to attach a sheave to one end and a counter-balance on the other. There are ways to do this using a steel rod, but it would have been significantly more difficult. My biggest concern was that a wooden rod might start burning if the fire got too hot. It ends up that there are other issues with a wooden rod which I’ll get into later. Once the pig was all set up, I tried to hook up the motor, but the motor was not nearly powerful enough and it would turn the sheave. Within a minute, I realized we were not going to have an automated rotisserie. That’s OK… Plan B… we’ll just crank it manually. For the rotation, we ended up using a clamp on the sheave to keep the pig fixed in different positions for about 10 minutes, then we would rotate it about 90 degrees. After about an hour of this, we started growing concerned that the pig was not cooking fast enough. We decided to amp up the heat and increasing the frequency of rotations. 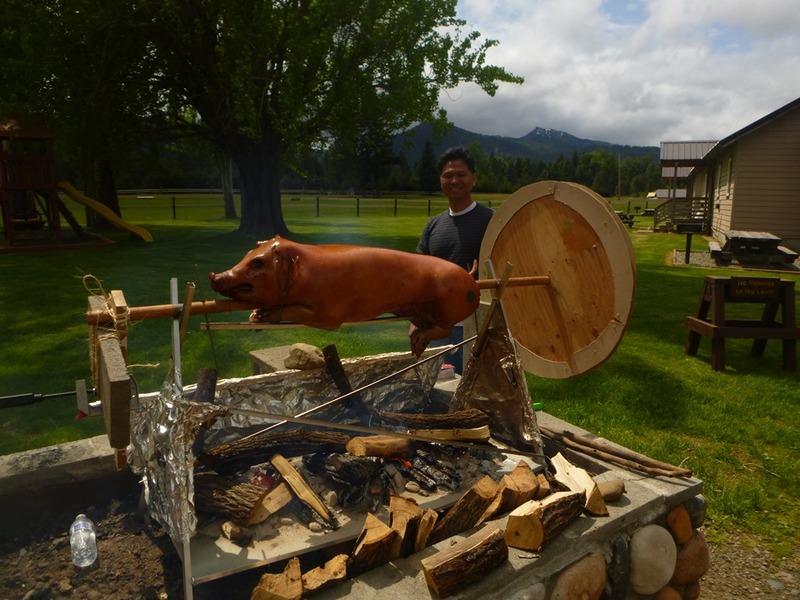 We started putting piles of wood on top of the coals, then rotating the pig at 1 minute intervals. The flames were coming up about 1/2 way to the pig and it was definitely cooking at this point. This probably goes without saying, but manually rotating the pig at 1 minute intervals was extremely tedious. I would not do this again unless I had complete confidence in an automated motor solution. Adam’s dad owns a garage door company. He mentioned that he had several old garage door opener motors. That probably would have been perfect. We may look at putting together a better solution for the next roast. I’ve secured budget for a Lamb Roast for my 40th Birthday coming up later this year… So, hopefully we can put together something before then. There were a couple times where we missed the 1 minute alarm and kept the pig in the same position for a little too long. It was interesting to see the liquified fat underneath the skin sloshing around. When the pig was in the same position for too long, the skin was start deep frying from the inside out. Apparently, this is how pork rinds are made. The skin start styrofoaming. Later, when we tasted this part of the skin, it tasted exactly like pork rinds you would buy at the store. Aside from a little bit of pork-rinding on the back side, everything seemed to be going well. Throughout the day, there was a little bit of rain sprinkling down on us, but nothing beyond a light mist. All the people at the ranch were wishing us luck because they saw that there was supposed to be rain that day. If it poured down rain, that would have been the end of the rotisserie. However, rain was not the issue. After about 7 hours of roast at 4pm, the unexpected happened. The closet rod broke in half in the middle of the pig. The pig hung loosely just inches from the fire. Adam jumped on top of the pit to hold the pig off of the fire. I ran and got a table set up with a tarp on top, so that we had a place to move the pig. Within a minute, we heave the hot carcass on top of the folding table. The backside of the pig burnt a tiny bit, but otherwise the pig was still intact. We removed the closet rod to find that the rod was assembled using offset half rods that were glued together. We saw that the heat and moisture inside the pig had made the joints expand and eventually the glue came apart. This is why you shouldn’t use a closet rod for a rotisserie stick. Now, we had a bit of a problem. Finding another rotisserie rod was out of the question. 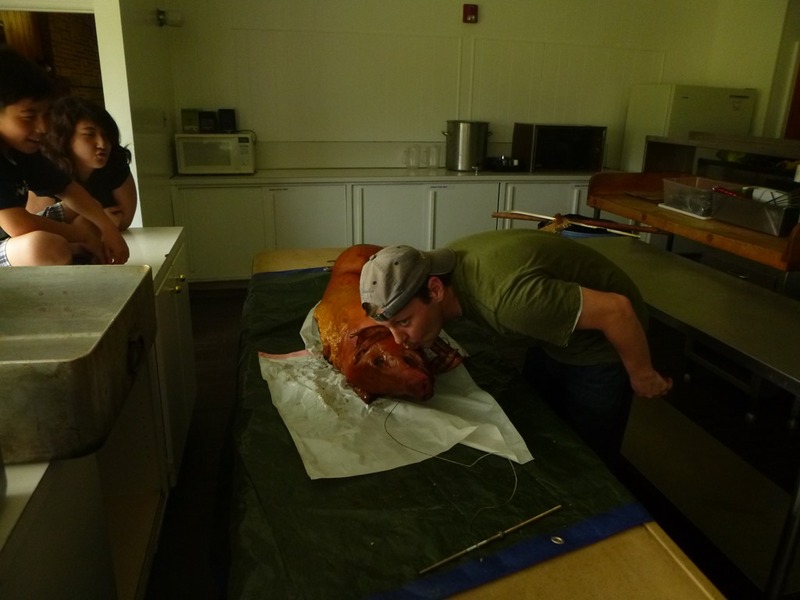 We transported the pig to the kitchen at the ranch. They had 3 huge ovens. Each of them could easily fit half of the pig. We cut the pig in half, put each piece in a large tray, covered it in foil, then popped them in the oven for the last 2 hours of cooking. But, before putting the pig in the oven, we took a few affectionate pictures. In the end, this was probably a good thing as we could comfortably cook the pig at a higher consistent temperature. We’ve had the pig on the rotisserie long enough that it got a very nice smoked color to it. In general, the pig was super moist and tender. A few people wished it had a little more flavor. We didn’t really season it other than the light salting and olive oil. The Korean people ate the pig with SaeuJeot (pronouned Sae-Woo Jot). SaeuJeot is fermented and salted shrimp. Adam tasted it and said it was saltier than salt. Some people also dipped the pig in GochuJang (fermented red chili paste). 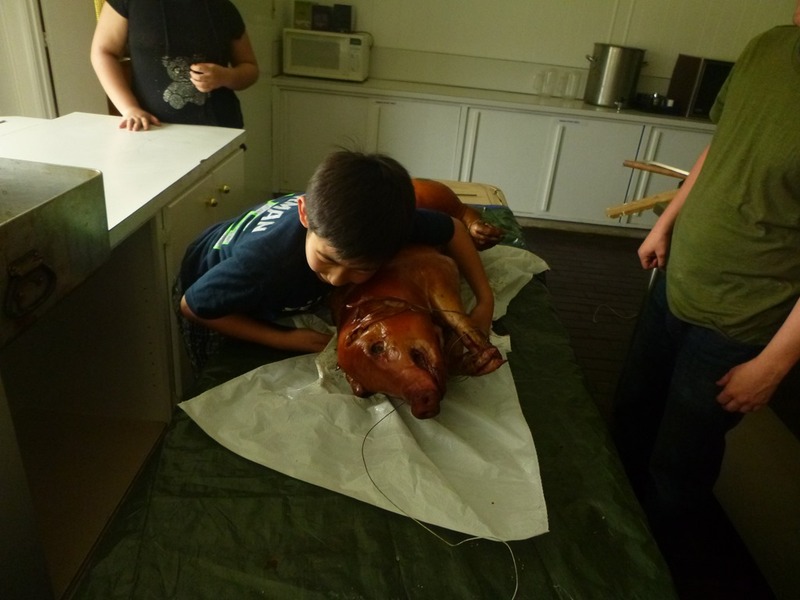 It was quite a bit of work, but at the end of the day, everyone got to eat pig and it was pretty delicious. Again, I can’t thank Adam enough for coming up and helping out with this project. Not only would it have been nearly impossible for me to set up by myself, but turning the pig every minute for 7 hours would have been unendurably dull. Needless to say, the emergency rescue once the rod broke would have also ended up in a bigger disaster. 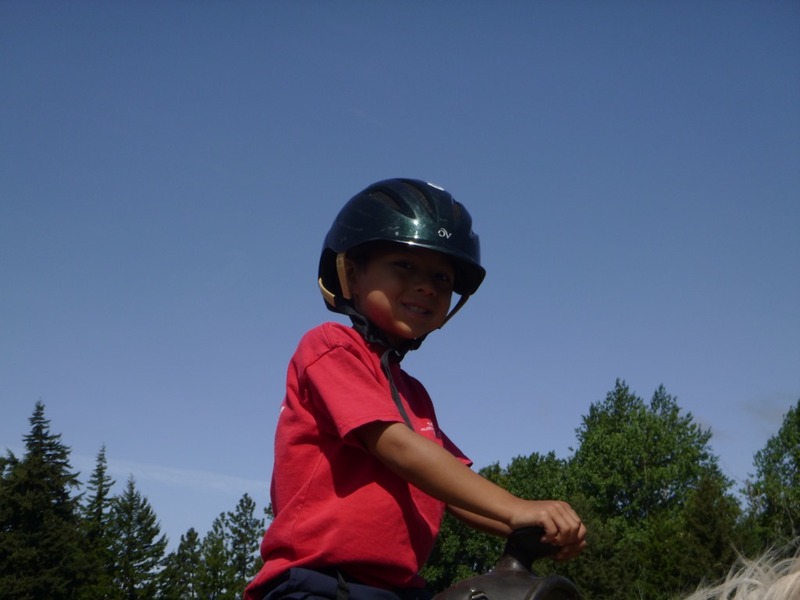 The following day, we enjoyed the other amenities at Ensign Ranch. Ensign Ranch is a property owned by the Church of Jesus Christ of Latter-Day Saints. For anyone interested, it is open to everyone. It is about 25 miles East of the Snoqualmie Summit ski resort. It is about $10-$30/night depending on whether you stay in a campsite or a cabin. There is horseback riding, canoeing, fishing, and a gigantic slip and slide. Most importantly, they have a pretty nice pit to do a pig roast. 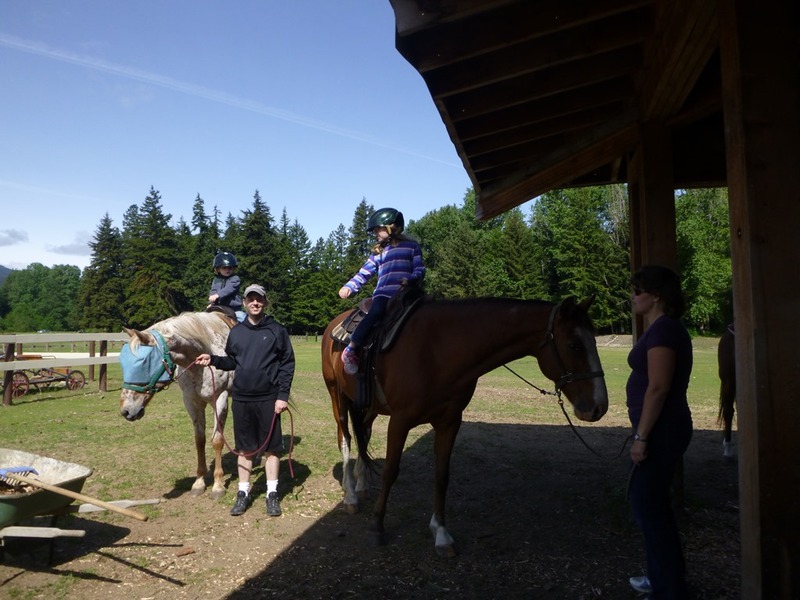 One interesting thing to note about Ensign Ranch (and other church-owned recreational properties) is that it is maintained and operated by volunteer church member missionary couples. All church members are encouraged to serve volunteer missions not only when they are 18, but also when they are older (Senior Missions). Senior missions are typically served by married couples that are empty nesters. Just like the 18 year-old missionaries, senior missionaries also save up money to fund their own missions. Tenille and I are also looking forward to and saving up for missionary service when our children take off for college. It’ll be a fantastic way to travel somewhere new and give service for a few years. This last weekend, we met missionaries from Utah, California, and Washington staffing various areas of the camp. The lady who checked us in was from Vernal, Utah at which point my eyes lit up. I’ve always wanted to visit Vernal which has the Dinosaur National Park. But, it’s about a 3 hour drive from the closest major city (Salt Lake City). She vouched that it was worth seeing. So, maybe I can try to convince my family to make that 6 hour drive commitment on our next trip to Utah. Oh Don I Love this! Adam is probably thanking you for the great adventure!